Grand Designs Live is the UK’s leading contemporary home show and it is based on the Channel 4 TV series presented by design guru Kevin McCloud. The exhibition is renowned for the presentation of new ideas, design and innovation for every type of home. and with over 500 exhibitors, across seven different sections, covering interiors, gardens, home improvement, self-build, renovations, technology and shopping, there really was something for everyone. 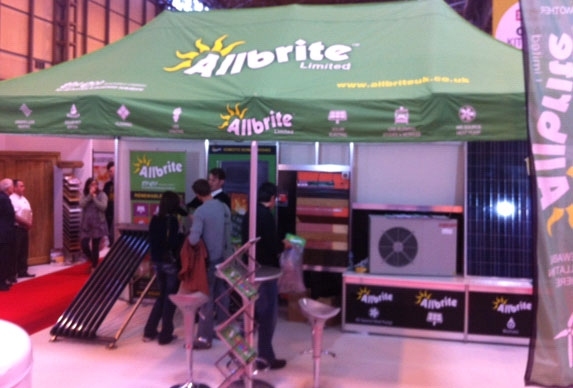 For over a decade Allbrite have been investing in innovative Renewable Energy Technologies and techniques. Originally the Allbrite contract flooring division introduced the AHT Amorphous Metal Ribbon Electric Underfloor Heating system to the UK and have since supplied and installed many prestigious housing and apartment projects. Managing Director Russell White believes in putting his money where his mouth is. He has recently completed his own eco house overlooking the Dee Estuary in North Wales. His home of course incorporates the AHT electric underfloor heating system and many of the products from the Allbrite portfolio.